i have Exchange 2010 in my environment, on client computer open Outlook first time and choose auto config (just wrote username and pass ) it says successful you set your account for outlook but the problem when i check details of account i see that it set as "IMAP" not exchange. Why ? i dont want to use it as imap where does take this config ? how can i change it ? 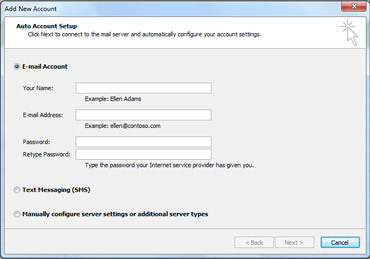 ﻿﻿Otherwise, you can enter your E-mail address and password to use Autodiscover service to auto-configure Outlook profile in your screenshot. Where do you see "IMAP"? When you check manually configure server setting and click next, you have 3 choices. Internet email is selected by DEFAULT. If you click next you’ll arrive at the page where you can only choice between POP3, IMAP and HTTP. This is where you are. Please select Microsoft Exchange for a local Outlook configuration. Make sure you have the correct version of Outlook as well. Yes on there account type looks IMAP as below. I mean be sure it's a version of Outlook that supports Exchange Server connections.